The office of Rep. Jasmine Lee (the Philippine-born parliamentarian in South Korea) was informed of the viral post. Her office coordinated with the Korean Embassy to get help to “Joseph”. His family has been contacted and the Korean community in the Philippines is helping him, too. Joseph worked in the Philippines as a call center agent. However, some unfortunate event happened that caused him to lose his job. Hopefully, he would be reunited with his family soon so he could get back on his feet. He is still young and with the right attitude he could get a second chance at life ~ good luck! May phone number po ba siya. 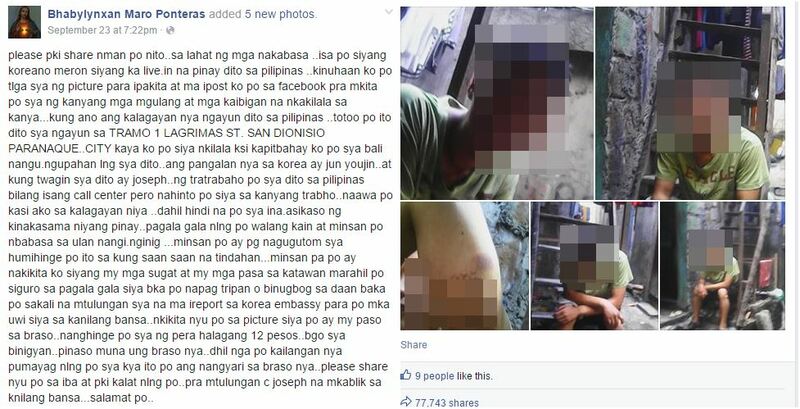 ?, Gusto ko siyang tulungan kong kaya niyang mag trabaho simple job lang , sa LEYTE PO AKO.